· Emphasis or give on Deposits. · Form a Saleable Product Scheme. · Selling Products in Rural or remote Areas. · Informing Customers or client About Products or new product. · Sale of Products and Services through E-delivery Channels. · Sale of Products and Services through Web-sites. 1) Financial Services Prices are Often Multi-Dimensional. 2) Elusive Measures of Quality. 4) Poor Consumer Price Knowledge. 5) Difficulty in Determining Customer Profitability. SUCCESS FACTORS IN FINANCIAL SERVICES ADVERTISING. 6. Use of Direct Marketing. STEPS IN ADVERTISING FINANCIAL SERVICES. (4) Developing the Contents of the Advertising. (5) Media Selection, Scheduling and Campaign Execution. Marketing by private sector banks and foreign banks is more effective than public sector banks because these banks are IT oriented. Private sector banks and foreign banks are attracting more customers by providing e-services. Thus, technology has become a challenge before the public sector banks. Often it happens that when a prospective customer approaches the branch, the employees seem to have very little knowledge about the scheme. This reflects an ugly picture of our bank’s image. Banks are not losing one prospective customer but 10 more customers who would be touch of this man. Attitude of the employees towards customers is also not very well. Thus, it is a need of time to reorient the staff. 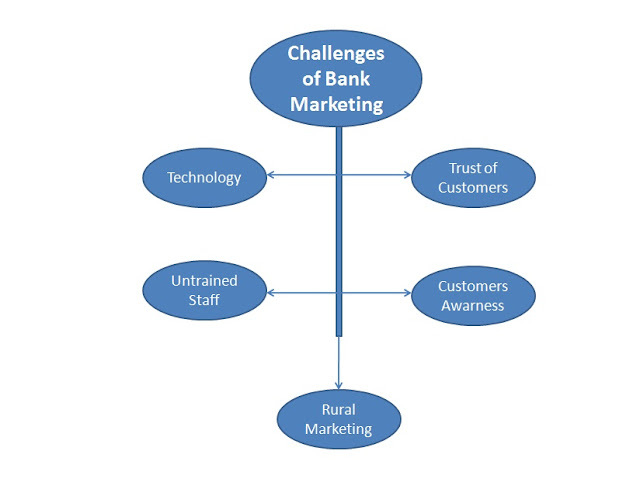 This is a big challenge before the commercial banks to enhance rural marketing to increase their customers. Banks should open their branches not only in the urban and semi-urban areas but also in the rural areas. Marketing can be enhanced only by increasing the customers. Customers can be increased or attracted only by winning the trust of the customers. Customer awareness is also a challenge before the banks. Bank can market their products and services by giving the proper knowledge about the product to customer or by awarding the customer about the products. Bank should literate the customers.